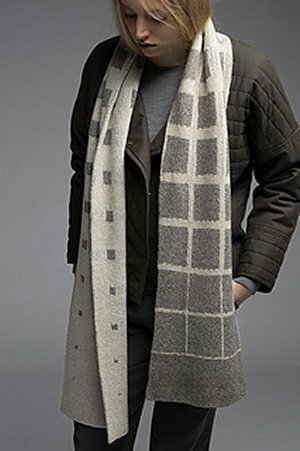 Taken from Shibui Knits Monochrome Patterns: "Playing with perspective, this double-layered scarf is knit in the round, the square motifs emerging from minute icons to prominent frames through the length of this piece. Use of negative space is further enhanced by the light and airy nature of this knit -- almost weightless in delicate cashmere-blend Pebble." NOTE: Darker color is recommended for Color B. This pattern is from Shibui Knits Monochrome Patterns - Lapse. Size US 7 - 16" circular needles (or size needed to obtain gauge), a crochet hook, stitch markers, scrap yarn, blocking supplies, and a tapestry needle are required but not included. Finished Measurements: 10" x 73.5" after blocking. Gauge: 24 sts and 26 rnds over 4". Colors Shown are Ivory and Ash. $301.00 -- Kit price including yarn only (no book or pattern).